This five reel, twenty five payline video slots game from Real Time Gaming is one of the most popular new games recently released by this provider. Sea Captain has a piscine theme with the ocean as a background and the symbols reinforcing the theme. The wild symbol in Sea Captain is the Squid icon, which shows up on the second and fourth reels of the game. The scatter symbol is the Sea Captain, complete with nautical beard and a pipe that blows bubbles. The other symbols carrying the fishing theme through include the Fish, the Ship, the Lighthouse, the Rope, the Crab, the Boots, the Hook, the Harpoon, the Tire and the Compass. Music with a seagoing flavor suits the fishing theme and the images used are very attractive, too. Fast paced and exciting, Sea Captain video slots will have players coming back for more. Betting in Sea Captain is done with coin denominations between 0.01 and 5.00, with a maximum of one coin allowed for each payline. All kinds of players enjoy this game, which offers twenty five paylines to choose from. One of the useful features of Sea Captain video slots is the auto play function which plays automatically according to the settings you have established. This is very convenient. The Squid is the wild symbol in this game, and getting this along with the Ship icon could win a player a jackpot of 10000 coins the highest. The second jackpot can be won with the Lighthouse symbol and the Squid icon this is worth 5000 coins. 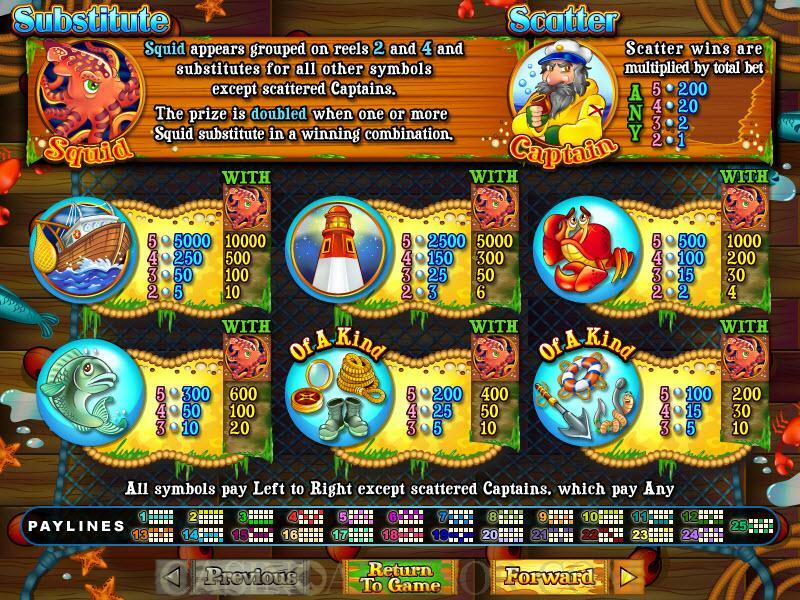 The Squid wild symbol comes in sets on the second and fourth reels of Sea Captain slots. If the wild symbol completes a successful combination in this game, winnings here are doubled. 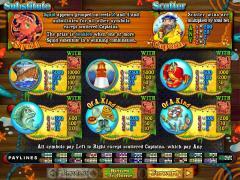 In addition to regular scatter winnings, the scatter symbol, the Sea Captain, can win you a lot of free spins. 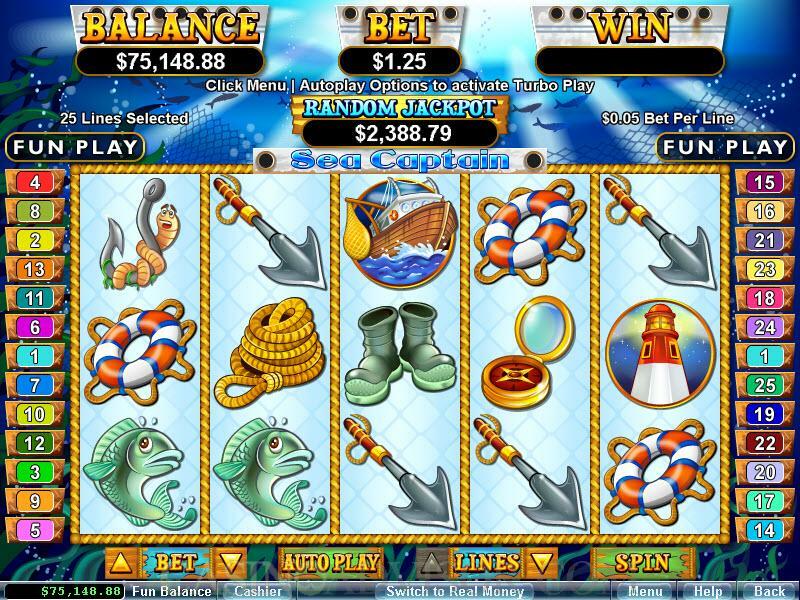 Three, four or five Sea Captain scatter symbols can win you up to seven free spins, and the rewards you win here are tripled. The best part about the free spins round in this game is that if you get at least three more Sea Captain icons while you are playing the free spins, you will win an additional set of complimentary spins. 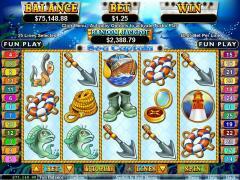 There is no limit on this type of bonus free spins generated by extra Sea Captain symbols. You can win up to 30000 coins in the free spins round. Good places to play Sea Captain video slots online include Sun Palace Casino, Slots Plus Casino, Bodog Casino and One Club Casino. Interested in reading more detailed information about Sea Captain? If so Click Here for more details.